Wuhou Memorial Temple Wuhou might be translated as "minister or war”. That was the title given to Zhuge Liang, a famous military strategist of the three Kingdoms period (AD220-280) immortalized in one of the classics of Chinese literature, the tale of the Three Kingdoms. 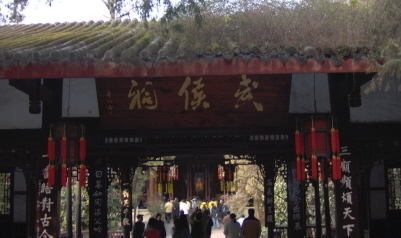 The shrine situated in the southern suburb of Chengdu. The Romance of the Three Kingdoms carries out the stories about Zhuge Liang. Reading these stories even in English translation is a great enjoyment. Qingyang Taoist Temple (Green Ram Temple) Qingyang Temple is one of the most famous Taoist temples in China. It is conveniently located in the northwest part of Chengdu, an old part of the city. The most magnificent building is the Eight Trigrams Pavilion. Built on square foundations, with a colored glazed dome on top, this octagonal building reflects the ancient Chinese philosophy that "the sky is round and the earth is square". There are eight pillars with dragons drawn in relief in the corridor, and colorful caissons and the symbols of eight trigrams are ornately arranged across its ceiling. Wandering through the temple, you can find some locals eating and chatting at the teahouse, this is a traditional and extremely popular pastime for the people of Chengdu. If you have time, joining the locals for a pleasurable afternoon at the teahouse is an excellent way to relax and enjoy the leisure life. Wenshu Temple Wenshu Monastery, located at No. 15 Wenshu Yuan Street, is the best-preserved Buddhist temple in Chengdu. 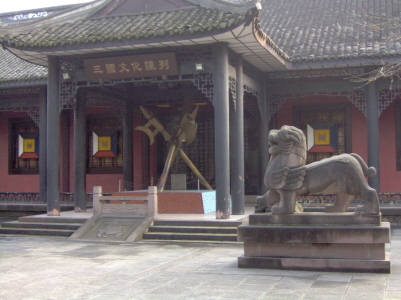 It is the home of the Buddhist Association of Sichuan Province and Chengdu City. Cultural relics are the highlights of Wenshu Monastery. Since the Tang and Song dynasties, over 500 pieces of painting and calligraphy by celebrities have been stored here. In the Sutra-Preservation Pavilion, many famous handwriting exhibits, paintings, and artwork are restored. Another treasure is a delicate jade Buddha statue brought from Burma to China in 1922 by Xing Lin, a Buddhist monk who walked the whole distance. In addition, the monastery houses some 300 Buddha statues of various materials including iron, bronze, stone, wood, and jade, some gloriously painted. In addition to its cultural relics, Wenshu Monastery is famous for its exquisite garden and solemn halls. Tourists and locals can enjoy tea in the Tea House while listening to music by folk composers.